I don't remember when exactly I read my first comic book" Palestinian scholar and activist Edward Said wrote in the introduction to Joe Sacco's seminal work of comics journalism "Palestine" "but I do remember how liberated and subversive I felt as a result. Edward Said in "Warning: This Article Contains Graphic Journalism"
Estamos na web a citar a citação duma citação da web, com a original ali na estante algures. Get it? Cómicos no digital, webcomics, media e punx: é nossa intenção expor-vos uma relação e terminar numa exaltação. Segue-se um resumo que nos despacham os propósitos aos media, de onde citamos abundantemente de uma pequena seleção de artigos que, mais do que o tema em si, importa-nos o que contexto em que foram escritos. Único pré-requisito: se chegaste aqui pressupomos que ultrapassaste todos os filtros de "espanta parvos" in place e escusamos-nos de te resumir o "4º poder" gone awry. Kudos. E com este único pré-requisito, saltamos mil páginas de catequese. Começamos por relembrar que a história dos comics e dos media já vem de longe. Da sua infância mesmo: é impossível sequer começar a compreender a banda desenhada na forma actual sem reconhecer a influência que esta deve à sua relação com os jornais norte-americanos do século XIX. De household names como Hogan’s Alley no New York World (1895), o Yellow Kid já no New York Journal (1896), The Katzenjammer Kids (1897), Little Nemo in Slumberland (1905), Mutt and Jeff (1907), Krazy Kat (1913), Gasoline Alley (1918), Little Orphan Annie (1924), and so on, aos cartoons políticos, às strips, aos sunday pages, quanto do seu formato e soluções visuais se mantêm ainda constantes e consequência directa desses tempo? No aspecto e soluções gráficas aos próprios conteúdos os comics foram em muito boa parte balizados para todo o sempre por esses primórdios de que emergiram e como nestes evoluíram semana após semana. Início de século XXI e as aventuras em spandex dividem atenção com novelas gráficas, de repente voltamos a associar (a possibilidade de) banda desenhada aos media, não sobre tiragens diárias de papel impresso -isso é tão século passado- mas no digital. The digiterati are often comics fans and comics creators have been some of the biggest beneficiaries of technology-driven self-publishing solutions as well as social media. Paradoxalmente, enquanto ameaça os media de extinção dos seus modelos tradicionais como sempre existiram, o digital permite o regresso à união comics & media como sua salvação possível - por razões bastante diferentes (*) da sua relação original (**), mas com a mesma intenção original (***). * Insert tha "troubles and tribulation of digital media"
*** Insert tha "we're still in dire need of tha frickin' eyeballs"
Esta é uma relação de que intuitivamente já suspeitávamos por experiência própria: não porque a tivéssemos procurado intencionalmente, mas porque algo -tipo, uh, olha onde estás...- no nosso dia-a-dia a foi impondo. E mordemos a língua não nos adiantarmos de assunto antes de tempo, mas - e se conseguires manter a memória do facto para retoma posterior-, não deixa de ser curiosa as datas de publicação destes artigos, que como as demais devolvem-nos a 2011,12,13: uma coincidência que abordaremos adiante também. this creative nonfiction can impact public policy and reach a broader audience"
Could comics save the day? That’s right, comics – those immensely popular picture and word stories you always flipped past the real news to get to – can they bring real news back to the masses? 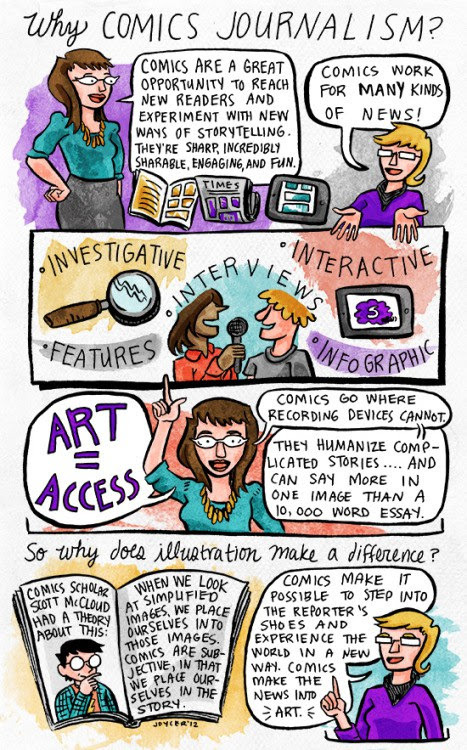 graphic journalism are comics about reality, about our world – not fantasy, nor escapism. This medium is still in its infancy, but illustrates a clear path forward, one especially critical for students growing up in an media-satured world, in which it’s hard to tell Kayne from Kosovo, the kerfuffles from the real news. E aqueles dois últimos textos? "when we look at simplified images, we place ourselves into those images. Comics are subjective, in that we place ourselves in the story" ... say "CHEESE"! (fará sentido aqui, prometo). Já sobre o "comics make the news into art" estamos conversados. Thirty-something Brooklynite, self-professed news-junkie and author Sarah Glidden laments that Iraq has become "yesterday's news," which editors now treat like yesterday's bread - a stale subject. While the troops' boots remain on the ground, foreign media bureaus - what's left of them - are in exodus and, thus, the continuing occupation of Iraq has steadily retreated from the headlines and into the backwaters of the paper, lost to microscopic print somewhere near a full page Macy's spread, the final destination before disappearing entirely. Glidden couldn't stand to be an idle bystander, watching from the safe distance of Internet Explorer as the story of the Iraqi occupation slowly died, the stories of refugees fleeing the war-torn nation consigned to footnotes in a future history text to be ignored by future college students. So, Glidden decided to take the news into her own hands. For the uninitiated, Glidden's quest to report from Syria without journalistic experience or funding and to do so in comics, may seem laughable. (...) And while many readers may not take her chosen medium seriously, Glidden, also observed, the average American reader - her 30-something urbanite friends in particular - don't take serious news seriously anymore. Her friends "hate journalists, distrust the media and want to tune out"
[Symbolia is] a Tablet Magazine of Illustrated Journalism, that will be subscription-based and will focus on “general interest stories and themes using multimedia, comics and journalism” (...) The journal will be completely digital and she said that it will not focus on “breaking news, but on the longtail news.” Polgreen said she’s compiled a “database of creators, illustrators and writers, and editorial standards are going to key. I want to advance the field of comics journalism, it’s about practicing what I’ve been preaching” (...) “People will get paid,” Polgreen emphasized, “journalists need to be paid and we’re looking at ways to offer a revenue share.” She said she’s also looking “media partnerships. We’re going to be an iPad app and we’re looking for ways to creatively syndicate our content and move it to different distribution channels. Symbolia Comics Magazine To End After Current Issue"
In a presentation called, “Reinventing the Graphic Novel for the iPad,” [Daniel] Burwen offered a very detailed history of the making of Operation Ajax (...) Burwen discussed the difficulty of recreating the traditional pacing of print comics—often tied to end of page and page turns—in a digital work where there are no pages. It took him 3 years to complete Operation Ajax (not counting 2 years developing the script) with a team of about 60 people and the work manages to combine traditional comics storytelling with an array of digital effects. Estamos muito longe do típico misfit aspirante das belas artes fechado no seu quarto ao som de bandas manhosas e a rabiscar doodles com papel e caneta. E ficamos a saber que o Burwen vem de um "background as digital artist for videogames”. Times a changin'. Por contraste, diziamos, webcomics. Let's talk punk. "The sort of people attracted to this are underdogs"
Apesar das incertezas, os comics estão agora extraordinariamente bem posicionados nos media como não estavam desde que se tornaram sinónimo de literatura infantil inócua mas sedutora de inocentes. E ainda que só o faça no gutter que separa as vinhetas, pelo menos o género reportagem que nos ocupa já transpira à politização dos cómicos. And so, to go against the heavy tide of the mainstream media, Archer and his fellow comics journalists have had to create a do-it-yourself culture, which means they not only write and draw, but self-publish, fund, market and sell their work to a skeptical, even cynical public. The real marginal art is not comics, but journalism itself. “Que engodo!" 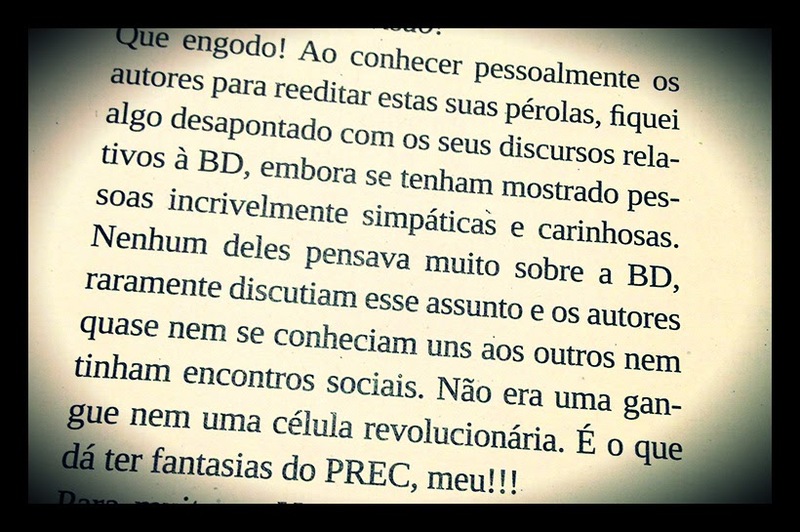 (... ) “fiquei algo desapontado com os seus discursos relativos à BD" (...) "nenhum deles pensava muito sobre a BD, raramente discutiam esse assunto" (...) "Não era uma gangue nem uma célula revolucionária. É o que dá ter fantasias do PREC, meu!!!" PRECários do flip-a-burguer: não estão a falar de vcs, mas estou a falar com vcs. Comics ... seemed to say what couldn't otherwise by said, perhaps what wasn't permitted to be said or imagined," Said reflected on why comics seemed so dangerous to his elders and so popular with his peers. "I knew nothing of this then, but I felt that comics freed me to think and imagine and see differently."